The Folger Shakespeare Library (201 East Capitol St. SE) will begin interior and exterior renovations to the building and grounds early in 2020. The goal of the improvements is to improve accessibility for the Library’s grounds, buildings and collections. 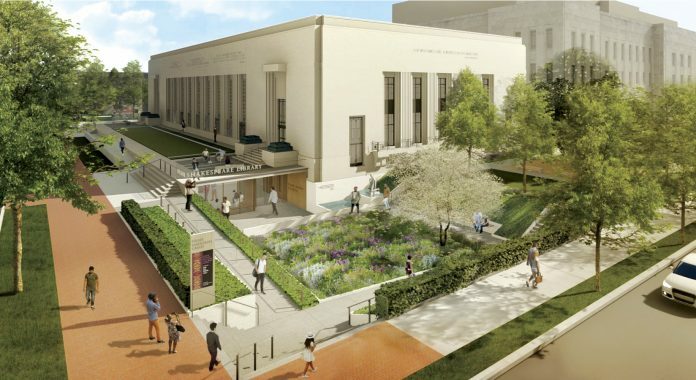 The fundamental idea, said the team that presented the concepts, is to open up the Folger both literally and figuratively, enhancing the public’s enjoyment of the grounds, building, events, resources and collections. “It will give us the ability to fulfill our mission in a way that we’ve never really been able to do before,” said Folger Director Dr. Michael Witmore. Witmore was appointed Director of the Folger in 2011, and immediately began working with the Board of Governors to draft a strategic plan, adopted in 2013. That led to the development of a facilities master plan for the Folger spaces, on which the renovations are based. “It was in the course of finishing that master plan that we realized the first and vital piece to begin with would be to truly open up the building and put the pieces of our program and mission together in a complementary way,” he said. The Folger was established in 1932 by Henry and Emily Folger as a gift to the American people, together with their collection of Shakespeare materials —the world’s largest such collection. It has since expanded its holdings to become a world-class research and resource center for Shakespeare studies with public outreach and education programs as well as productions by the Folger Theatre, concerts by the Folger Consort, readings at the O.B. Hardison Poetry Series, and the publication of the Folger Shakespeare Library editions, as well as myriad online resources. 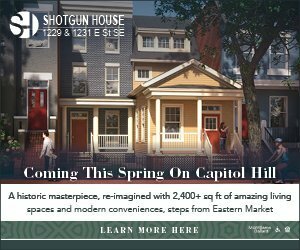 The concept design expands the interior rooms underground into public space below the plinth, the elevated platform along East Capitol Street, to include two new exhibition spaces. The new North and South Galleries will both be open to the public. The new pavilion will include gift shop and washroom facilities supporting the galleries and the theatre, as well as two elevators that will provide accessibility within the building, including to the theatre balconies. Witmore said that the galleries will allow the Folger to display many of the most rare and well-known items in their collection. All 82 of Shakespeare’s First Folios, the collection of works by Shakespeare printed in 1623, will be displayed as a collection for everyone to see, he added. On the exterior, the building’s main entrances will be relocated to newly created East and West Public Gardens. A sloping walkway will make the plinth itself accessible so that visitors can see the nine famous bas reliefs along the façade. “The idea is that the whole perimeter of the building can return to its original vision, which is an open garden with the building sitting in the middle of it,” said Stephen Kieran of Kieran-Timberlake, the architecture firm engaged for the project. All of the entrances will be made fully accessible, as well as the interior space and the exterior plinth, which will be graded to allow access at the front of the building. Currently the main entrances are accessible by temporary ramps, but these are not graded to support electric wheelchairs. Stairs in the interior also inhibit accessibility to exhibits. The plans eliminate the turnaround driveway on Second Street as well as the associated curb cut. The iron fence on Third Street will be removed to open the garden to public use. A great deal of exterior public seating will be added, and the gardens will be illuminated by ‘discrete’ public lighting. Bicycle racks will be added to both Second and Third Streets as well as to the south side of the building (for staff) as part of the Folger’s continuing efforts to encourage the use of public transit and cycling by both staff and visitors. The Folger is planning to run its full slate of programming through the end of construction, expected in mid-2022. Negotiations with other venues to host the next full season of production are underway. The Consort Series is anticipated to take place at St. Mark’s Episcopal Church. Poetry readings, as always, will take place in a variety of locations. Alternate locations for the theatre performances have not yet been finalized. Education programs will continue at District-area schools. The building will be closed and the collections relocated during construction, although staff will continue to work from the building. “The ability to go off-site with new partners and to co-program or to present Folger programming in new venues is actually one of the exciting aspects of the project, because we would love to weave our programing and who we are even deeper into the web of Washington cultural life, and taking our work off-site is one way to do that,” said Witmore. Historical Preservation Specialist Emily Eig is advising the Folger on historical aspects of the renovation. The exterior of the building was designated a National Historic Landmark in 1963 and the interior was added to the register in 2017. Alterations to the building must therefore go before both the Historic Preservation Review Board (HPRB) and the Commission of Fine Arts (CFA) before permits can be approved. 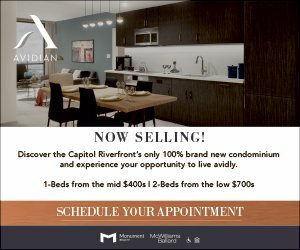 A Public Space Application will be heard by the District Department of Transportation (DDOT) in April, followed by May appearances before CFA and then HPRB the following week. The Folger Library was created and is maintained through philanthropy, and it is that generosity that is supporting the improvements for the community, Witmore said. “This is really being done through the generosity of people who love this mission and care about its place in Washington and the world,” said Witmore. Each year, the Library embarks on a campaign to raise funds to support its operations. Learn more about The Wonder of Will: The Campaign for the Folger Shakespeare Library, by calling 202-675-0303. The Folger’s Capital Campaign launches Monday, April 15 at the Annual Folger Gala, the largest and most significant fundraiser of the year. Learn more about the Folger Shakespeare Library and theatre or support the Folger by visiting Folger.edu. Purchase tickets to the Folger Gala at folger.edu/folger-gala. Email questions or comments about the Folger Facilities Master Plan designs to info@folger.edu.